Russian camera brand to partner with a "leading photographic equipment company"
A Russian news service has announced that a new full-frame mirrorless camera will be launched under the Russian Zenit brand. The Krasnogorsk Mechanical Plant (KMZ), which has traditionally produced Zenit-branded cameras, has not manufactured a Zenit-branded film camera for the last 12 years, and has not yet brought a digital model to market. This latest news, however, suggests that Zenit will be an unexpected third brand to join the full-frame mirrorless market, after Sony and Leica. The announcement, made on the Russian information service RNS, quotes Zverev Igor Sergeev, Deputy Director General for Civilian Production and Consumer Goods at KMZ. Sergeev also said that the camera would be made available in “light and dark” finishes, and decorated in leather, using high-quality finishing materials. He went on to say that the camera would be available in both Russian and foreign markets. Although Sergeev did not mention any specifications or pricing of the forthcoming model, he did state that the company was not intending to compete with well-known manufacturers of photographic equipment, but that the camera would cost more than a good smartphone. The cheapest mirrorless full-frame camera currently on the market is Sony’s A7 II, although older examples of Sony’s first-generation A7 cameras can still be found for less. The last announcement from Zenit came early last year, in the form of three wide-aperture prime lenses. The Zenitar 50mm f/0.95, Zenitar 50mm f/1.2 and Zenitar 85mm f/1.2 are designed for users of Sony FE, Canon EF and Nikon F systems. Last year, the was reportedly planning on releasing a camera that would rival Leica’s offerings, although nothing has materialised as of yet. 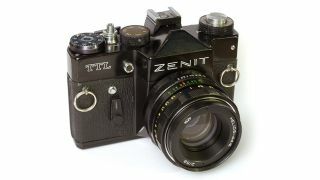 Zenit’s first camera was an SLR based on a Zorki 35mm rangefinder camera, which itself was produced in the same KMZ manufacturing plant as Zenit’s models. Production of all cameras appears to have halted in 2005.